Taylortown AME Zion Church (10901 Ballardsville Road Louisville, KY 40241). Robert Leon Davis, Sr., 83, of Louisville, Kentucky, passed away peacefully on Monday, December 3, 2018 at 5:40 pm. He was born on September 9, 1935 in Shelby County, Kentucky to the late Dumar Davis and Addie Beckley Davis. He worked for Phillip Morris, retiring after 30 years and was a U.S. Navy Veteran. He was preceded in death by his wife Ellna Davis, sister Mary Frances Stone, son Clyde Marshall, Jr. He was a member of Taylortown AME Zion Church. He is survived by his children Sharon Davis Manica (Ronald), Robert Davis, Jr., (Leighann) and Arlene Davis Jones. He is also survived by his friends for life Bettie Peake and Ayanna Peake. Visitation will be held on Saturday, December 8, 2018 from 1:00pm until the time of the memorial service at 3:00pm at Taylortown AME Zion Church (10901 Ballardsville Road Louisville, KY 40241). The family requests that contributions in Robert’s memory be made to the American Cancer Society. To leave a special message for the family, please "Share Memories" portion below. 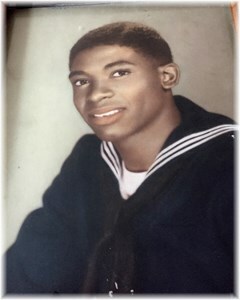 Add your memories to the guest book of Robert Davis, Sr.. So sorry , will keep the family in prayer....???????? PRAYERS AND CONDOLENCES EXTENDED TO THE FAMILY! !